Complete Protein Blend (Organic Sprouted Whole Grain Brown Rice Protein, Pea Protein), Organic Brown Brown Rice Syrup, Dark Chocolate Coating (Organic Cane Sugar, Chocolate Liquor, Cocoa Butter, Sunflower Lecithin), Organic Tapioca Syrup, Organic Brown Rice Syrup, Organic Dates, Chocolate Liquor, Dried Coconut, Vega Saviseed (Sacha Inchi) Oil, Inulin (from Chicory Root), Cocoa Powder, Organic Agave Syrup, Natural Toasted Coconut Flavor, Organic Vanilla Extract, Sunflower Lecithin. Complete Protein Blend (Organic Sprouted Whole Grain Brown Rice Protein, Pea Protein), Dark Chocolate Coating (Organic Cane Sugar, Chocolate Liquor, Cocoa Butter, Sunflower Lecithin), Organic Tapioca Syrup, Organic Brown Rice Syrup, Organic Peanut Butter, Organic Peanuts, Organic Dates, Chocolate Liquor, Vega Saviseed (Sacha Inchi) Oil, Inulin (from Chicory Root), Brown Rice Crisps, Organic Peanut Flour, Organic Agave Syrup, Sea Salt, Organic Peanut Extract, Sunflower Lecithin. Complete protein blend(sprouted whole grain brown rice protein, pea protein), dark chocolate coating (organic evaporated cane sugar, chocolate liquor, cocoa butter, sunflower lecithin, vanilla), EnergySource (grape juice, natural rice dextrins), sorghum syrup, inulin (from chicory root), dates, Vega SaviSeed (sacha inchi seeds), pumpkin seed butter, sorghum crisps (sorghum, rice, tapioca, evaporated cane sugar, quinoa, guar gum, salt), natural flavor. Brown Rice Protein, Pea Protein, Tapioca Syrup, Organic Agave Syrup, Organic Sugar, Vegetable Glycerine, Sunflower Seed Butter, Palm Kernel Oil, Chocolate Liquor, Sunflower Oil, Rice Starch, Natural Flavors, Cocoa Powder, Cocoa Powder (Processed With Alkali), Inulin (from Chicory Root), Tart Cherry Powder, Sea Salt, Sunflower Lecithin, Peppermint Oil. Do not use if seal is broken. Store in a cool, dry place away from direct sunlight. Brown Rice Protein, Tapioca Syrup, Pea Protein, Organic Sugar, Vegetable Glycerine, Organic Agave Syrup, Peanut Butter, Palm Kernel Oil, Sunflower Oil, Rice Starch, Natural Flavors, Organic Peanut Flour, Cocoa Powder, Chocolate Liquor, Inulin (from Chicory Root), Cocoa Powder (Processed With Alkali), Tart Cherry Powder, Organic Peanut Extract, Sea Salt, Sunflower Lecithin. Contains Peanuts. Manufactured in a facility that also processes dairy, soy, egg, and tree nuts. 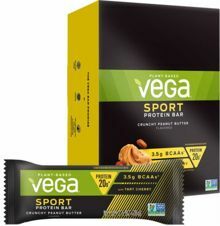 A delicious, post-workout bar packed with 15 grams of complete, plant-based protein, Vega Sport Protein Bar is formulated to strengthen and regenerate muscles. 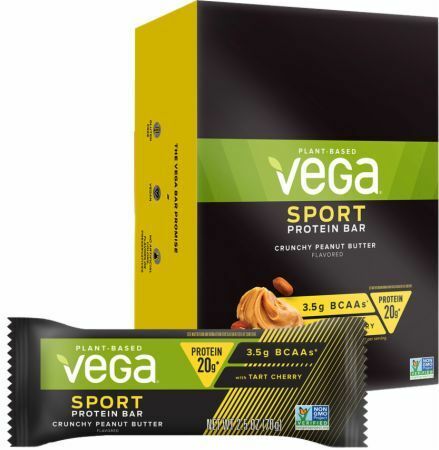 Formulated by Brendan Brazier, professional Ironman triathlete and bestselling author on performance nutrition, Vega Sport Protein Bar is 100% plant-based, gluten-free and contains no artificial flavours, colours or sweeteners. Take Vega Sport Protein Bar after training or as a nutritious snack to recharge and repair so you can do it all again, sooner.